WASHINGTON - The Secretary General of the OAS denounces the self-inflicted coup d’état perpetrated by the Venezuelan regime against the National Assembly, the last branch of government to be legitimized by the will of the people of Venezuela. 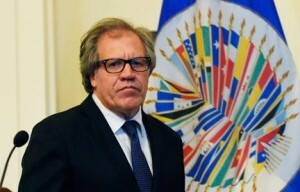 “Unfortunately, what we had warned has now come to pass” said the Secretary General of the OAS, Luis Almagro. The Supreme Court of Justice (TSJ) has issued two decisions which strip parliamentary immunity from members of the National Assembly and which, contrary to all constitutional norms, provide for the TSJ to assume the legislative function. This was done in a manner which ignores even the most basic guarantees of due process. The first of these decisions, issued March 27, 2017, declares all legislation passed by the National Assembly unconstitutional, calling support for the Inter-American Democratic Charter a treasonous act even though it is a legal document Venezuela signed. Venezuela was also the first country to invoke the Charter, in 2002. Through its second decision, issued March 29, 2017, the Court declared the “National Assembly to be in contempt and nullified its actions.” This decision was taken without any constitutional basis, neither through authorities granted to the Assembly (Article 187 of the Constitution), nor those of the Constitutional Chamber of the TSJ (Article 336 of the Constitution). It violates both the separation of powers guaranteed by Constitution and the obligation of all judges to respect and “ensure the integrity” of the Constitution (Article 334). Universal norms as well as regional and international agreements, to which Venezuela is a Party and therefore obligated to enforce, define the separation of powers as a necessary guarantee to protect the rights of citizens and defend democracy and the rule of law. The unconstitutional decisions by the TSJ to strip parliamentary immunity from the members of the National Assembly and assume the legislative function are the latest actions taken by the authoritarian regime to subvert the constitutional order in Venezuela and eliminate all semblance of democracy. Section 4.4 of the TSJ decision states: “So long as the National Assembly remains in contempt and its actions nullified, the Constitutional Chamber of the Supreme Court will ensure that parliamentary functions are exercised directly by the Chamber or by the organ that it designates, in order to guarantee the rule of law”. This decision violates Article 187 of the Constitution which outlines the legislative powers of the National Assembly. Sub-section 24 guarantees those powers in accordance with the Constitution and the law. The restoration of democracy is an obligation we all share. It is time for the hemisphere to work together to help restore democracy in Venezuela. We have an obligation to the people of Venezuela to act without further delay. To be silent in the face of a dictatorship is the lowest indignity in politics. “The question is between liberty or despotism.” Our oppressors are our oppressors because they threaten the very basis of our liberty and therefore must be the object of our struggle. The Secretary General calls for the urgent convocation of the Permanent Council under Article 20 of the Democratic Charter. He stated that the situation has reached this point despite the warnings outlined in the reports of May 30, 2016 and March 14, 2017. The head of the OAS recalled the preventive nature of the Inter-American Democratic Charter, which should have been rigorously followed to prevent another coup d’état in the hemisphere.